The choir is the oldest part of the church, built at the end of the 1100’s. It was probably built on private initiative. The chapel’s south wall had two arched windows, traces of which remain on the interior wall. Another window was on the east. No vaults had yet built, so the church had either a flat roof or open truss roof. Later in the 1100’s, the choir was modernized. It also received brich arches and a sacristy at the north side of the chancel was built. The purpose of the sacristy was to protect the church’s possessions, which is the reason for that room’s heavy barrel vault ceiling. By the mid-1400’s, the church had the brick arches throughout and the walls and ceilings painted with frescoes. The porch was added at the end of the Middle Ages. Extensive restoration was carried out in 1759 under the leadership of the wallmasters Petter and Eric Roos. The chancel walls were raised so its roof had the same height as the nave’s. The windows were slightly enlarged, the exterior walls plastered and the murals whitewashed over. It was probably during that restoration when the triumphal arch between nave and chancel was added. Another major restoration took place in 1797 under the direction of master builder Neosander. An antechamber on the west was built of half-timber with brick fill on top of a high stone foundation. At the west side of the fore-room, a staircase of Gotland stone was added to reach the second floor of the anteroom. The entrance in the southern porch was walled up and it was converted into chapel. It was worked on again in 1915 under the leadership of Jon Sigurdsson Curman. 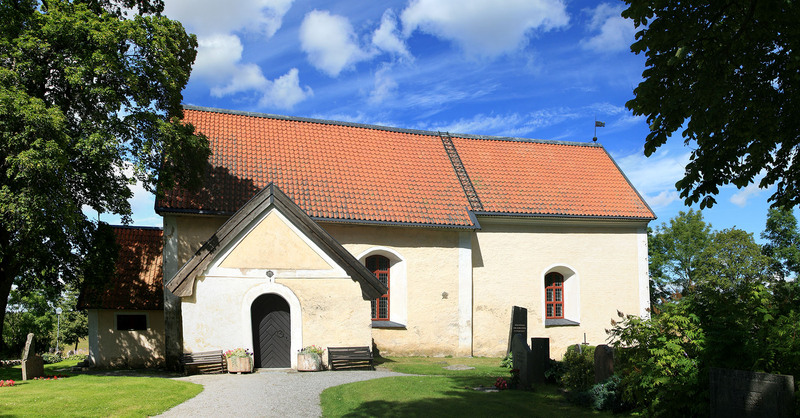 The southern chapel was again restored into a porch with the entrance opened. The western antechamber was decorated porch to chapel and had the upper floor removed. The chapel’s ceiling was fitted with wooden barrel vaults.